2nd graders working on classwork. With station rotation students are able to work on different assignments at their level. 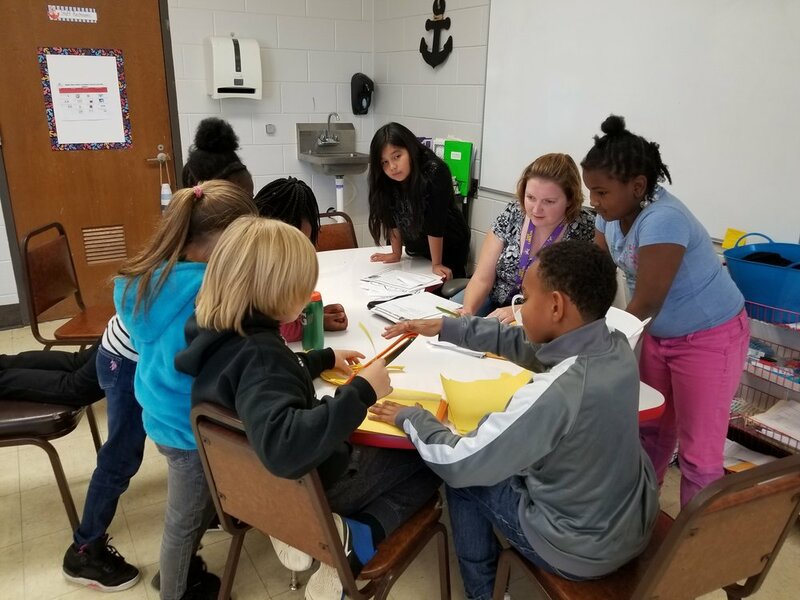 3rd graders working with their teacher Mrs. Combs. Our focus is on serving our students through an innovative blended learning model that allows the students and teachers to take ownership of the teaching and learning process through personalized and customized application of knowledge. Students will spend roughly 65% of their time engaged with face-to-face teachers and 35% their time engaged with digital content. Ignite Innovation Academy - Pitt will work to ensure age appropriate usage of technology in terms of time on computers. We have carefully researched and learned that blended learning models show the most promise in providing personalized and differentiated instruction. This helps to connect students to real-world application of their knowledge; thus the students become much more engaged in their learning. Ignite Innovation Academy - Pitt will utilize a sound base curriculum (Core Knowledge) for Science, Math, English/Language Arts, Social Studies and Creative/Visual Arts in our blended learning classrooms. We will also embed a robust leadership curriculum with a strong foundation of leadership and character enrichment. Our goal is to ensure relevance and application of knowledge by having students 'apply' learning to real-world science projects. In addition students will engage in physical/emotional fitness opportunities that align with our school's mission. Throughout their learning journey here, Ignite Innovation Academy - Pitt will provide students study in leadership theories, give them the opportunity to participate in leadership projects within the school and surrounding community, and demonstrate their understanding of leadership concepts through demonstration of competencies (projects, solutions, etc.). We believe that this merging of curricula will not only close achievement gaps and help keep students engaged in authentic learning experiences, but provide responsible and resilient students who are prepared for high school and post-secondary .